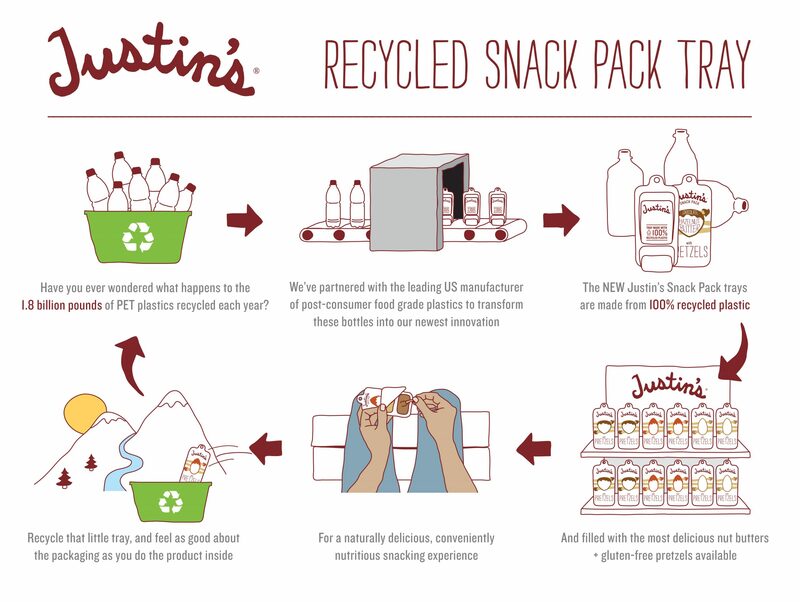 The folks over at Justin’s were looking for a convenient and fun design for their new Snack Packs’ packaging. With one part Justin’s nut butter and one part gluten-free pretzels, the snacks are a slam dunk when it comes to taste, but Justin’s wanted to feel as good about their packaging as they do the product inside. Placon designed a convenient, all-in-one package that can stand-up on its own and is peggable, providing retailers multiple options for merchandising. Available in three varieties exclusively for Target stores, the custom thermoformed package is made from 100% post-consumer recycled PET from bottles diverted from landfills. Placon’s EcoStar facility reclaims and recycles curbside collected PET bottles and thermoforms, crushing, washing and reusing the extruded PET roll stock for new applications like Justin’s!